The molded Ryton plastic junction box has outstanding chemical corrosion resistance, superior thermal stability, high strength and rigidity, and is nonflammable. 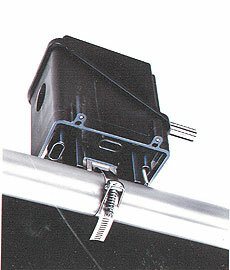 The RTES End Seal Fitting is a NEMA 4X rated enclosure designed to terminate all OMEGALUX™ heating cables. This model provides waterproof cable entry for one cable, enclosure support and a waterproof corrosion resistant enclosure. The fitting has two different curved mounting surfaces. One side has a 11/2-inch radius curved surface which provides a stable support on pipes with a diameter of three inches or more. The other side has a 1/2-inch radius curved surface which permits a better fit on smaller pipes. In addition, this side also has four “feet”, for installation on flat surfaces. Attach the RTES End Seal Fitting to a pipe using OMEGALUX fiberglass tape.